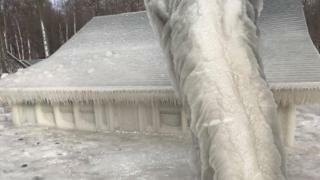 Turbulent waves and high winds have turned a family beach home into an "ice house" at Ramona Beach, in Pulaski, New York. Maureen Whelan's family has used the house for the past 85 years, but none of them has ever seen anything like this before. Maureen shares the house with her brother and sister, and together they have been trying to chip the ice off the roof. "We're devastated" she told the BBC. High winds of up to 70mph (112km/h) at the end of February created massive waves from Lake Ontario, which blew spray onto the houses and then froze in the chilly temperatures. This is what the house looked like before it was covered in ice. Maureen said the family have been creating channels so the ice can drain properly once melting occurs, in the hope of minimising water damage. She says the property is not in a flood zone so insurance may not cover any damage. The home has a lakefront barrier which helped to protect it but there is four feet of ice in front of the house. "They're all smiling and making the best of an unfortunate situation" says local reporter John Kucko in a Facebook post. "We're the fourth generation to live in this house," said Maureen. "This house holds many generations of memories. We're not wealthy people." She said they've used pumps inside, following the advice of local people: "We're going up with chainsaws this weekend." People living next to Lake Ontario have been experiencing extremely cold weather conditions. BBC Weather presenter Nick Miller said: "Strong winds have blown water and spray from Lake Ontario onto the house which has then frozen producing a layer of ice. "It seems this weather pattern has continued long enough for the layer of ice to become unusually thick." People have been sending messages of support to the family on social media. Mary Lee Boardway-Keding told the family: "Wow, having grown up in Oswego, and my parents having a place at Brennan's Beach I know how destructive the lake can be but I have never seen anything like this. "Praying the damage will be minimal for you. It is a beautiful cottage and I know how much your Dad loved it." Peg Martin writes on Facebook: "We wish we could have helped you. Ramona beach family, Peg and Tom." Beth Murray writes: "The family that chops ice together stays together!" Sandy Laveck-Burkovich says: "Wishing for a happy ending with no damage to the house itself!" The house and its surroundings have been attracting local photographers like Scott Schild and John Kucko's daughter Natalie.